In any marital or family disagreement where you are consulting a family lawyer, both parties should be encouraged to try and find the answer by agreement if possible. They are the ones who are directly affected by that outcome, and it is invariably better if they reach a compromise themselves, rather than having a decision made for them by a court. However, trying to reach agreement when your relationship has broken down isn’t always easy. What are the various ways you could try to achieve this? 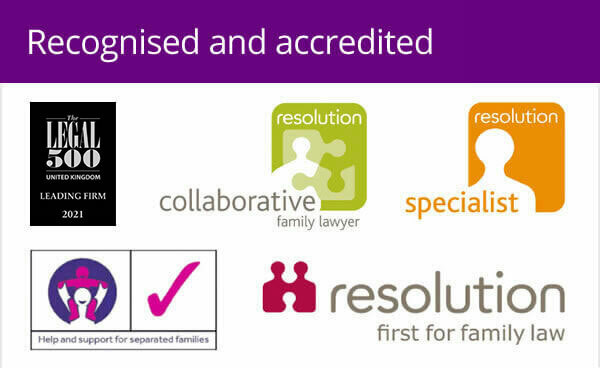 Family mediation should not be confused with relationship counselling. It is nothing to do with why the relationship ended, rather it is a time and a place to sit down and discuss the consequences of that breakdown and try and resolve issues such as how this affects finances or children. Mediators are not allowed to give legal advice, but there are many mediators who are also experienced family lawyers, and this may help guide the discussions. A mediator is not a judge, and is not allowed to make the decision for you if you cannot agree. They remain neutral. The process can in some circumstances also give an opportunity to actively involve the children so that their views can be taken into account in decisions. Following changes in 2011, anyone thinking of applying to court for a family law matter is expected to find out about the mediation process before making their application. It is believed that this will change in due course so that people will be required to actively try mediation before applying to court. Legal aid is still available for the mediation process for people who are financially eligible, and even if you are not, it is worth bearing in mind that mediators often charge rather less than family lawyers! Mediation is not for everyone – there may be cases where one party feels intimidated by the idea of facing their partner and having to make decisions which will affect their future without having support there. In cases where there has been any domestic abuse mediation will not be appropriate. It will only work well if both parties are willing, and open to compromise. Even where mediation is being tried, both parties should always also get advice from an experienced family lawyer as to their options – and whether solutions being explored are the best they can realistically hope for. With many family law issues, particularly financial matters, there is more than one possible “right answer” and understanding what a court may accept as a solution is important to be able to have sensible discussions. Any agreement between the parties reached at mediation for example will not become binding until the parties have had the chance to get advice, and potentially turn the agreement into a court order where appropriate. It is also your family lawyer’s role to be proactive – guiding you through exchanging financial information, helping you to understand possible solutions, and in putting together proposals. 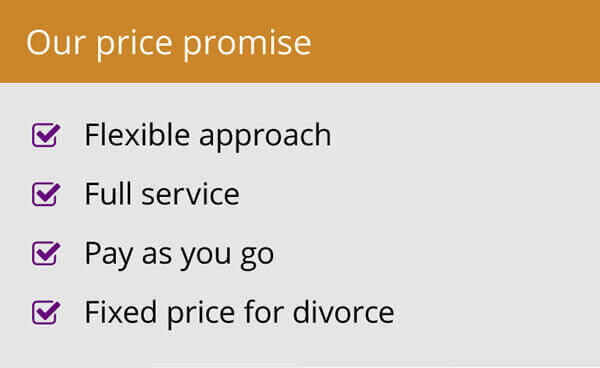 Remember to be clear with your lawyer what work you want them to do if you are wary of running up fees. Many family lawyers are also willing to be even more involved, including arranging to “round the table” meetings with you, your ex-partner, and their lawyer, to try and agree terms. This can be a very productive way of moving things forward, and is similar to the way the court will expect a case to be resolved. Ask your lawyer if this approach is suitable in your case. If a financial settlement can be agreed, there may not be any need for court hearings at all. In some cases it is necessary to involve the court to achieve a solution. This may be because the other party is intransigent, or unreasonable, or even because they have failed to engage in other ways of trying to resolve the issues. Sometimes the only solution that will work is to make an application, and then the other person will be directed or even ordered by the court to do what is needed to try and sort things out, or eventually, the court will simply make a decision for them. The idea of starting court proceedings can be quite scary. This is not least because of the amount of costs which could be involved – sometimes many thousands of pounds. However it is worth remembering that even within court proceedings, you will both be encouraged as the case progresses to try and reach an agreement if possible. Of the cases that are issued in court, the vast majority will actually settle, rather than be decided by the court. Sometimes it is worth thinking about whether to issue an application in court at an early stage in the case – particularly if you know the other party will not co-operate. It can actually sometimes be quicker and cheaper to do this rather than wasting time and money chasing after them. It is important that you have an understanding of which way you think it will be best to try and resolve your case. Don’t forget you have a much better knowledge of your own and your opponent’s personality than your lawyer does. You will be expected to provide documents to prove your circumstances (called disclosure). This will usually include P60, last 3 wage slips, or tax returns for last 2 years, company accounts for 2 years (where appropriate), an idea of the value of any properties, mortgage statements, bank/building society statements for all accounts for the last 12 months, a list of your regular monthly outgoings, details of the Cash Equivalent values of any pension you may have and any other evidence of assets (eg policies, shares etc) and of liabilities (loans, credit cards etc). Gathering this information together comprehensively, and early on, will help move the case forward more quickly, and cost effectively. Be clear what is important to you – whether this is wanting to stay in the same house, or ensuring you have a pension in retirement for example. This will help your lawyer guide you as to whether what you want to achieve is realistic. Do some simple budgeting exercises such as investigating tax credits, working out what child support is payable, looking at what accommodation you could get elsewhere, finding out how much mortgage you can borrow – and working out what your outgoings will be if you achieve the outcome you want, to see if it is feasible. This will help narrow down the possible solutions considerably. Be prepared to make decisions – your lawyer’s job is to give advice, your job is to give instructions. Be careful how much you involve the children in the “adult” issues. It is important to listen to what they say, but not to draw them into matters which they should not have to deal with. Ask your lawyer about the Separated Parents Information Programme – a short course designed to help parents understand the best way to resolve issues for their children when they separate. Be realistic – there is no point asking for the children to be with you 50% of the time if you are at work full time and not able to care for them. The more practical your proposals are, the more likely they are to be accepted. Be specific – how should weekends work? What about other holidays, Christmas, Easter, the summer? What about birthdays, or mother’s/father’s day? Find out when the children’s school holidays are and set out with dates how you would like it to work. If your plans are vague they are unlikely to be understood and accepted. There is a commonly held misconception that family law cases are always acrimonious and lawyers often make this worse. Whilst it’s true that a breakdown in a relationship creates difficulties for all concerned the way you choose to approach the problems will have the biggest influence on how much time, money and heartache is involved. 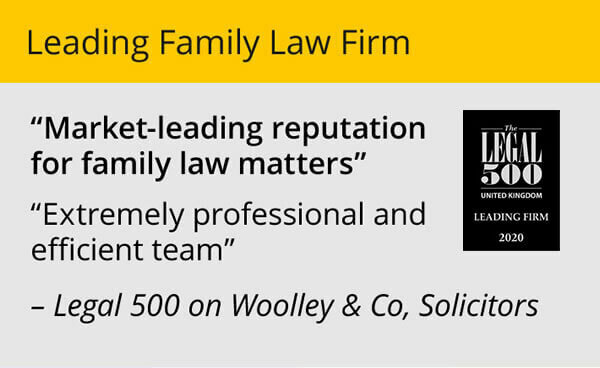 At Woolley & Co our experienced family lawyers work hard to find amicable solutions for clients, providing services at all stages of the process whether for initial advice, support through the mediation process, help to negotiate a fair settlement or guidance, advice and support through court proceedings. To discuss your circumstances with an experienced family lawyer call 0800 321 3832, or complete our appointment booking form here. A pre nup – insurance for married couples? Separation or divorce – which solution is right for you?